O’Reilly Digital Media has posted a review of the Yamaha Pocketrak 2G digital audio recorder, which was launched earlier this year. The Pocketrak 2G is more of a high end voice recorder than a low end radio/podcasting tool. But depending on your needs, it might be appropriate for either personal or professional use. First the good news. O’Reilly reviewer Mark Nelson reports that the recorder is tiny, at about 1.25″ x 4.6″ x .5″ and weighing just 1.7 ounces. The audio quality when using the built in mics is decent if not spectacular. And the recorder can handle up to 44.1kHz/16 bit WAV audio as well as MP3 recordings. It has 2GB of internal storage and a built in USB plug so you can copy recordings to a PC without lugging any cables around. 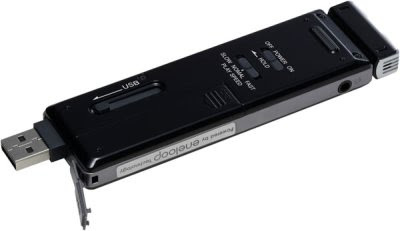 The recorder uses a rechargeable battery and is supposed to get up to 19 hours of MP3 record time (although somewhat less when used in WAV audio mode). If your battery dies can replace it with a standard AAA battery or pick up another rechargeable battery. Now for the bad news. Because the recorder is tiny, so are the buttons and display, making the recorder a little tricky to manipulate unless you use the automatic level control. The level meters only display when you’re in record standby mode. When you’re actually recording you’ll have to content yourself with staring at the LEDs that light up when your audio is close to overmodulating. And the highest quality MP3 setting available is 128kpbs. Nelson posted several recordings made with the internal mics and they sound pretty good. But I’d like to know how the recorder sounds when using an external mic or a line input. With a street price of around $300 , the Pocketrak 2G seems like one of the best digital voice recorders around. But it’s difficult to say whether it’s up to the task of recording interviews for radio or podcasts. For the same price you can pick up an Olympus LS-10 or Edirol R-09HR , both of which have received a number of positive reviews from radio producers. While editing Mark’s review, I started to wonder if the Pocketrak 2G is a rebadged Olympus voice recorder. The design and file system certainly look similar. And Olympus recently announced the DS-71, a model that records in WAV format. And the Pocketrak CX, mentioned in the review, looks an awful lot like the Olympus LS-10. Theories aside, I’m a fan of stereo voice recorders. Like camera phones, they’re always ready to capture an interesting event. But the ear is more forgiving than the eye, I think, so many of my voice recorder “snapshots” have ended up in real productions.